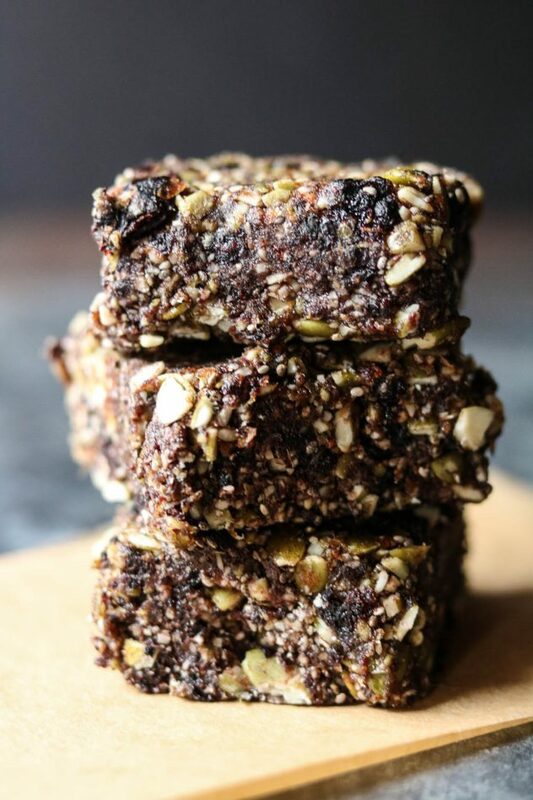 Nut-free energy bars. If you were to ask someone who has a severe nut allergy, like myself, what their number one Paleo food challenge is, they would probably respond with one of two answers; granola or energy/protein bars. 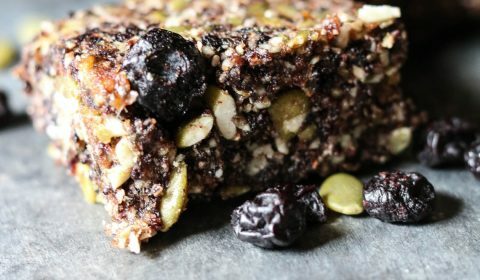 You would not believe how hard it is to find a good granola/energy/protein bar that doesn’t contain some form of nut or nut ingredient (nut butters). Quest bars, Larabars, KIND bars, most all of these have a nut-based ingredient. There are a FEW that do not, however, who has time to review every single ingredient label on each bar to find the select few that don’t contain nuts. I knew there had to be a way to create a tasty, nut-free energy bar but it took some experimenting to get it just right. 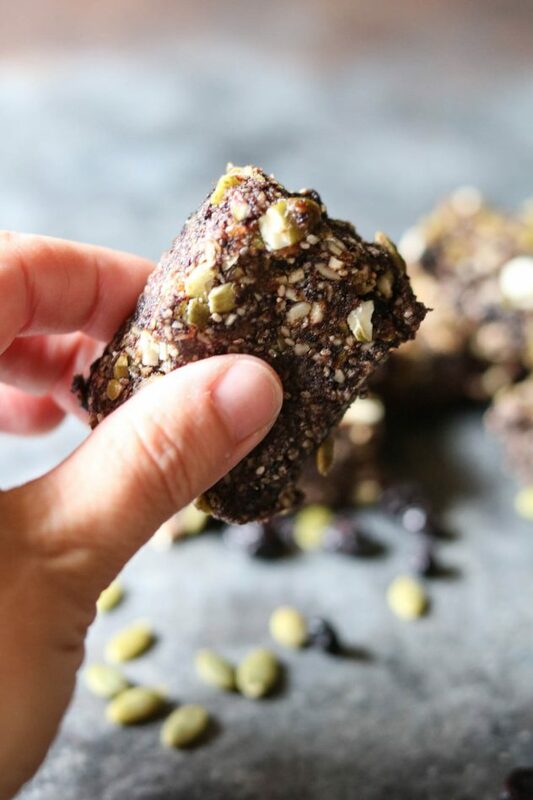 This energy bar uses seeds instead of nuts, along with dried fruit and Medjool dates (which are quickly becoming my go-to ingredient) to create a perfect chewy, yet crunchy, snack. I can’t wait to test out additional variations using different dried fruit and seed options. I do recommend using a food processor, rather than a blender, for this recipe. I haven’t had much luck with mixing Medjool dates in my blender. They tend to gunk up the blade, keeping the ingredients from getting fully mixed together. I picked up my food processor for under $30.00 and it’s been a life-saver! Once all of the ingredients are mixed well, simply press into a 8×8 dish (I lined mine with parchment paper for easy removal) and let refrigerate for about 30 minutes. Then cut up into whatever size bars you’d like and take on the road with you. I have to travel this week for work so you bet these will be traveling with me! 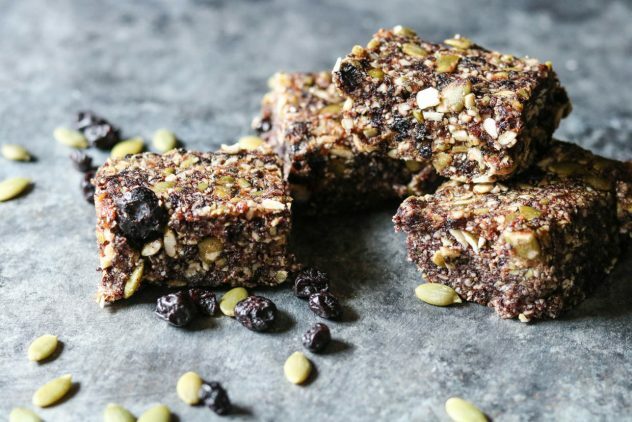 The perfect energy bar with no nut ingredients.